In the wake of the transformation from a socialist to a neoliberal capitalist economy, Tanzania has witnessed an unprecedented proliferation of cultural production which went hand in hand with a steep rise in formal and informal media outlets. Bongo Media Worlds provides insights into the diverse and creative practices of producing and consuming popular media in Dar es Salaam, the country’s cultural capital. Bongo, an augmentative form of the Swahili noun ubongo meaning brain, is the popular nickname for Dar es Salaam and by extension the whole of Tanzania: One has to use one’s brains to survive in the city. The term bongo has therefore come to encapsulate the notion of creativity and the readiness for improvisation born out of circumstance and necessity. It mirrors a positive self-image of Dar es Salaam’s inhabitants and the citizens of urban Tanzania at large. The spirit of bongo is also manifest in Dar es Salaam’s vibrant media landscape and its inhabitants – the producers and consumers of the various forms of popular media culture. 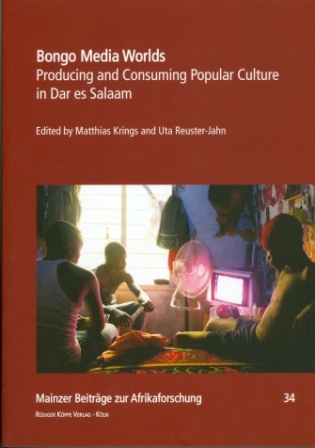 This collection of essays presents ethnographic case studies on some of the media worlds that have developed in Dar es Salaam during the last two decades under conditions set by economic liberalisation, political democratisation, technological innovation (in particular digitalisation), and globalisation with all their manifold implications. Eleven lively essays cover media and genres ranging from bongo flava music and video clips to bongo movies, televangelism, televised political satire, comics, live interpretation of foreign films, living rooms, and beauty pageants. Matthias Krings is Professor of Anthropology and African Popular Culture at the Department of Anthropology and African Studies at the Johannes Gutenberg University Mainz. Uta Reuster-Jahn, Dr. phil., is Lecturer in Swahili at the Asien-Afrika-Institut, University of Hamburg. She has published extensively on Tanzanian orature, popular Swahili literature and bongo flava music. In Bongo Media Worlds the focus is put on the actors in Tanzania’s contemporary media worlds: the producers whose entrepreneurial spirit is highlighted, as well as the consumers – although it is shown that in some cases no sharp distinction between the two categories can be made. [...] due to the close cooperation of all authors throughout the whole process from preparation over fieldwork to writing up, the volume is much more coherent than many other edited collections. This is certainly also due to the common methodological approach which all chapters share. All the researches presented in the book are based on an ethnographic approach, which involved at least a certain/some degree of participant observation. In several cases the researchers even been involved themselves and took over crucial roles in their field of analysis, such as Gabriel Hacke who worked as a cameraman in Bongo Flava video productions, Claudia Böhme who acted in various Bongo movie productions, or Tanja Rohrbach who became the ‘matron’ of the young women who participated in the Miss Tanzania pageant in 2009. Their reflections on the advantages and drawbacks which close involvement in one’s field of research brings with it are interesting and important parts of their respective chapters. [...] the in-depth case-studies presented in this volume take the reader on a fascinating journey into contemporary Bongo media worlds, whose dynamics can only fully be understood by looking at the diverse genres and phenomena in interplay. This new volume is therefore highly recommended reading for anyone interested in popular culture in (Eastern) Africa and in Swahili studies more generally.